Racial separatism, gender discrimination, and white dominance have historically thwarted black Americans' occupational aspirations. Access to medical education has also been limited, and mobility within the profession, leading to unequal access to health care. There have, however, been notable triumphs. 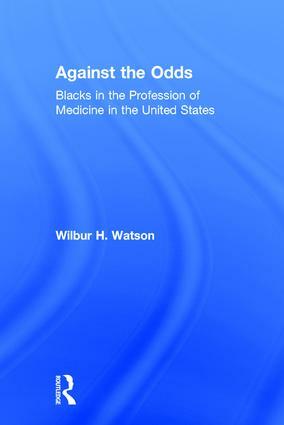 In Against the Odds, Wilbur Watson describes successful efforts by determined individuals and small groups of black Americans, since the early nineteenth century, to establish a strong black presence in the medical profession. Changes in medical education and hospital management, desegregation of the medical establishment, and the contemporary challenges of managed-care organizations all attest to their achievements. Watson analyzes sociocultural, political, and psychological factors associated with African-American medical practice; race and gender differences in medical education and professional development; and doctor-patient relationships during and since the period of racial separatism. He discusses the policy implications of physicians' viewpoints on issues such as folk practitioners as health care providers, medical care for the poor, abortion and euthanasia, the Tuskegee syphilis experiments, and the emergence of managed-care organizations. Through in-depth interviews with older physicians and comparative analyses of their situated techniques of coping with racial discrimination and segregation, we gain insight into the effects of separatism on the minds, selves, and social interactions of African-American physicians. Finally, Watson outlines current ethics, demographic changes since desegregation, the contemporary status of black physicians, and recent changes in the socioeconomic organization of the profession of medicine. Against the Odds is a unique study of the history, ethnography, and social psychology of blacks in medicine. Watson successfully debunks the myth that black physicians were less competent providers than their white counterparts: a myth that persists to this day. First-person accounts, from periods of socially and legally sanctioned racial separatism and the first three decades of desegregation in the United States, bring readers closer to the physicians' lived experiences than mere social or quantitative description. This engaging account will interest those in the fields of African-American studies, medicine, and sociology.